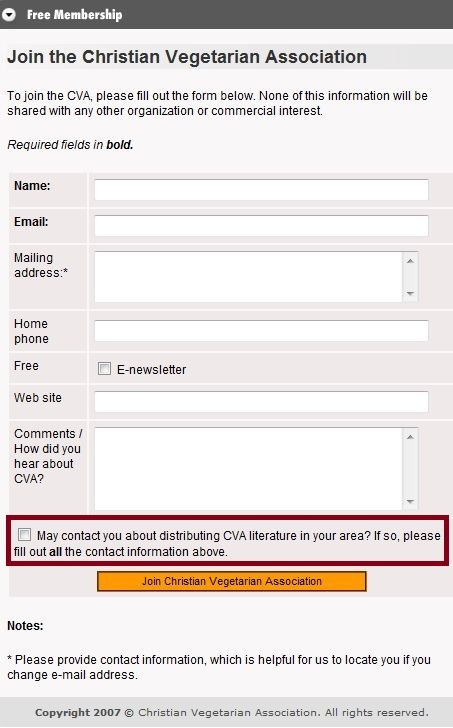 Today I joined the Christian Vegetarian Association (CVA) in the hopes of finding more like-minded people (both Christian and vegan) to socialize with. It is the only Christian based vegetarian/animal advocacy group that I have found so far and I like that they have a mission that is similar to P.E.T.A. but with Christian based morals as well. You can visit their website to get more information about their organization as well as read their past newsletters and sermons related to Christianity and a Vegetarian/Vegan lifestyle. They also have a Yahoo! group which lists a schedule of their leafleting and tabling events. 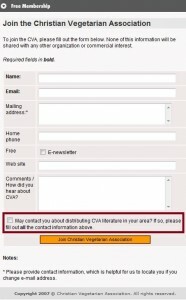 CVA is free to join but has the following paid memberships. Paid memberships are renewed annually. If you are already a member, please use the same email for your PayPal payment that you used when you first signed up. If you’d like here email, make a request using this site’s contact page and I will get it to you. You can also (preferably) check the last box when you sign up for a free membership and she will get in touch with you directly. Stephen R.L. Clark, D. Phil., Fr. John Dear, S.J., Daniel Dombrosi, Ph.D., De Ronda Elliott R.N., C.S., M.T.S., Elizabeth Farians Ph.D., William Greenway, Ph.D., Rev. Frank L. and Mary Hoffman, Stephen R. Kaufman, M.D., co chair, Rev. Prof. Andrew Linzey, Ph.D., D.D., Rev. George H. Malkmus, Rev. Linda McDaniel, Stephen H. Webb, Ph.D., co chair, Richard Alan Young, Ph.D.